Eight years ago, Purdue University students could scroll through their BlackBerrys using the institution’s Signals application to learn about their risk of failing a particular class. Now, they can use the school’s new app, Forecast, to learn not only how difficult a class is, but also which courses may be enjoyable for them. 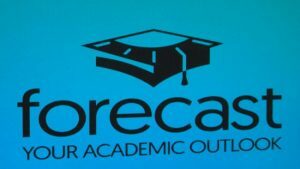 Forecast, which was released in March, uses data analysis to help students do well in school and maintain healthy habits. The app collects information regarding club participation, class difficulty, and exercise habits. Students can log on and learn about courses they never knew existed in high school and clubs for sports they always wanted to try. Gerry McCartney, chief information officer of Purdue, said that one trend the data analysis revealed is that students who enrolled promptly for classes tended to perform better in those classes. About 600 students registered for the app when it was released in the spring. McCartney said that number will drastically increase when 7,000 freshmen descend upon West Fayette, Ind., in a month. A total of 38,000 students are registered for the fall semester. While Forecast entered the student body without any fanfare last semester, the freshmen will already be familiar with it before they set foot on campus. The university’s administration wrote to all the incoming students, describing the app and heralding its availability. McCartney said that the announcement was widely accepted; only four or five out of the 7,000 wrote back asking further questions. McCartney, whose alma mater had only 1,100 students, mentioned that small schools offer little room to explore because students already know all their peers as well as the activities available to them. With a large school like Purdue, there are many more options. The purpose of the Forecast app is to alert students to these options. It provides a recommending service, telling students they might like a certain club or class based on their participation in other clubs or classes. Data analytics is a topic for many university administrators across the country. McCartney stated. Forecast built and expanded upon the foundation set by the original Signals app. Other universities are working to establish similar apps of their own. He stated that, without a doubt, large universities could benefit from data analytics tools. According to McCartney, big data is important in helping people know what surrounds them. He used the example of a student applying to college. The student has heard of certain schools, and applies to the ones he or she feels would be a good fit. However, there are thousands of schools that student has never heard of. Big data can tell that student about schools that he or she never knew would be a good option.